Start by secretly culling the spade royal flush to the top of the deck. (Using the under spread cull, taught in Ultimate Oil & Water, you can do this between effects in one casual run-through of the deck under any pretext.) Give the deck three faro shuffles. It doesn't matter whether they are in-faros, out-faros, or any combination thereof. And they don't have to be perfect splits. Explain that you're going to ask several people to help you shuffle the cards. (You need an audience of at least six people.) 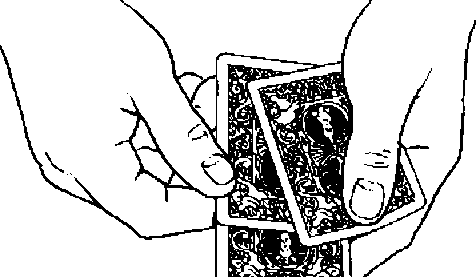 Spread over eight cards and hand them to a spectator, instructing him to mix them thoroughly. Do the same thing with four more spectators. Finally, hand the remaining packet of twelve cards to a sixth spectator for shuffling. Although each of the first five packets must contain exactly eight cards, the audience must not realize that the number of cards matters. It must appear that you're just handing bunches of cards to people. The best way to accomplish this is to group-count the cards, pushing over three, three, and two. You can do this by casually glancing down as you push over the cards. However, I have found that, with practice, it's completely practical to do this by sense of touch alone. By pushing the cards over the tip of my left second finger I can control whether I push over three cards or two cards. This way, I can maintain eye contact with the audience as I distribute the cards and make the whole process look truly casual. As the spectators finish shuffling their packets, retrieve the cards. It doesn't matter what order the cards are collected in except that original bottom packet must go back on the bottom. When you see that the spectator who has this packet has finished shuffling, take the cards back from him and hold them in dealing grip. After that, just let the other spectators drop their packets on top of the ones you already hold. Stress that you will not shuffle, cut, or in any way alter the order of the cards that the spectators have just shuffled and returned to you. Point out that, in most forms of poker, the largest number of players you can have is eight. Explain that "to make it more of a challenge" you1ll deal out the maximum number of hands, eight. Your three faro shuffles set the five royal flush cards eight cards apart. This means that each of the first five spectators received exactly one pegged card in his packet. Despite the spectators' shuffles, each royal flush card remains in a separate eight-card bank. This means that, if you now deal an eight-handed game, you'll encounter exactly one pegged card on each round, no more and no less. Turn your cards face up to reveal that you received a royal flush under truly impossible test conditions.